Some women indulge themselves with expensive perfumes, dark chocolate, or spa visits. I subscribe to Accessible Archives. For a modest yearly fee, I can search every issue of Godey’s Lady’s Book ever published, not to mention lots of other great historical sources. The only down side is that since I find whatever I want immediately, I rarely bother to browse. And browsing is the best way to come across what you aren’t looking for. Given my recent obsession with petticoat trimming, I earmarked it for a trial run. And last week, I pulled out my crochet hook and a skein of cotton thread and whipped up 4 repeats of the pattern. Since the way thread and needle sizes are designated have changed since the 1850s, it’s always a bit of a guessing game to see which you should use. I had number 16 cotton on hand, and a size 10 (1.3 mm) crochet hook. The hook was a little small for the thread, but the next one up in my kit was far too big. I really like the way this pattern looks. Though I would prefer a finer thread. Probably a great deal finer. Like most crochet edgings, it starts with a chain as long as you will require. There are only 7 rows, but at least two are quite involved. I think it would be slow going to trim a full petticoat, though not nearly so slow as Broderie Anglaise. And the effect would likely be stunning. I had to fiddle with the pattern a little to make it work; thank heavens for the picture, which helped with intuitive leaps when the written directions became unclear. Some of the changes I made might not have been necessary though if I’d been using finer thread…and the end result would likely have been neater. Oh, and if you are afflicted with curiosity, like me and the cat, real guipure is a heavy needlepoint lace in which the patterns are connected by thread ties or mesh. 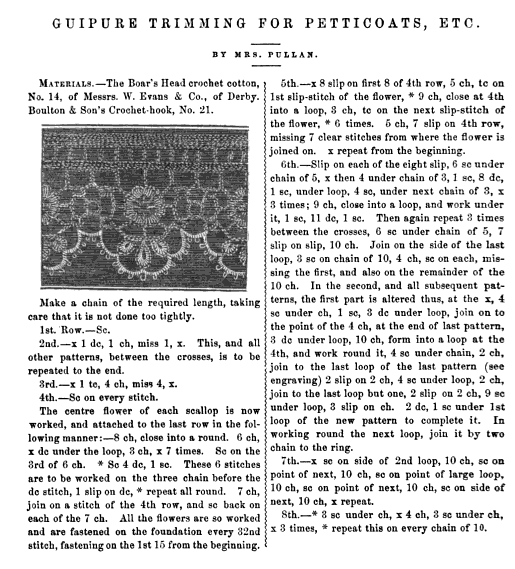 True lace, which was phenomenally expensive in the mid-19th century, was often imitated by crochet. One of the most noted examples of this is the legendary Irish crochet: “faux” laces created with great dexterity and sold by women to support their families during the Famine. Incidentally, by the end of the 19th century, exquisite Irish crochet was valued on its own merits, rather than its ability to mimic more expensive laces. Ahhhhhhhhhhhhhhhhhhhhh! It’s gorgeous and fills me with envy!! On my list of “things to theoretically do if I wasn’t running a fashion manufacturing company” would be to learn crochet. I’d like to try to get to it sometime this year. Particularly because it seems perfect for edgings etc of this sort. Very perfectly Victorian! I can’t wait to see what you use it on. You are really making progress in your “accurate recreation of a complete 1850s ensemble from the drawers up” project! You can learn to crochet so quickly — and it’s a most relaxing pastime. In a way it’s even better than knitting because you don’t have to be so careful about counting or not stopping in the middle. I’d be honored to teach you.